Want to have the smoothest eyeliner around? Try your hand at painting on fuller lashes with a liquid eyeliner. This inky paint will give you the darkest lash line and sleekest application of any eyeliner on the market. Choose your liquid eyeliner. So you’ve made the decision to use liquid eyeliner, but now you need to choose the best application style for you. Liquid eyeliner comes in two main types: felt tip and a dip-brush. Felt tip liquid eyeliner is very similar to a marker, and has the eyeliner fed through it like a pen. 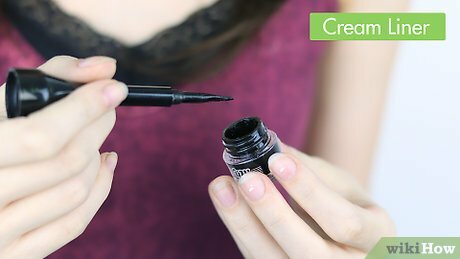 A dip-brush liquid eyeliner is similar to nail polish in that it comes with a small bottle of the eyeliner with a brush that must be dipped in in between each application. Prepare your eyelids. Applying eyeliner is a middle step to be done after you put on your eyeshadow but before you put on your mascara. 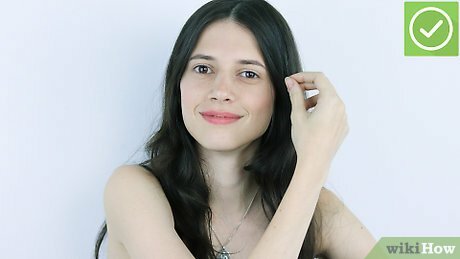 Put on an eyelid primer to help your eyeshadow and/or eyeliner stick to your lid for the whole day. If you plan on wearing eye shadow, apply it now and your eyeliner will go over the top. Get in the right position. The biggest problem with applying liquid eyeliner is lacking a steady hand, causing a wavy line and uneven application. To rectify this problem, rest your elbow on a table and your hand on your cheek as you apply. If you are able, hold a small hand-held mirror in your opposite hand instead of using a large mirror so that you can get a good view of your eyelid and liner application. Draw a row of dots or dashes. When applying liquid eyeliner, avoid putting it on in a single line; doing so will increase your chances of a wavy line and uneven tail end. Instead, start by drawing small dots or dashes directly along your upper lash line, evenly spacing them apart. Connect the dots. Use small, short, slow strokes to connect the dots or dashes you created along your line. You will be able to create an even line on both eyes that lacks any bumps or waves by following this method. Avoid connecting all the dots in a single stroke, but use several small strokes between each mark. Smooth out your line. If you find that the top of your line shows the breaks between the dashes, steady your hand and draw a thin line along the edge to smooth it out. Do so on the bottom edge of the liner as well to fill in any space between your eyeliner and your lash line. Add your tail. Regardless of the type of eyeliner that you use, a small tail should be created at the outer edge of your eyelid to give the illusion of a continuation of your lash line. Use your eyeliner to draw a small line extending upwards on your upper lash line, but drawn at the same angle as the upwards curve in your lower lash line. Draw a small triangle from the end of the line with the upper lash line and fill in the space. You can stop it early for a natural look, or sweep it far up your lid for a classic cat eye. Finish your makeup. With the completion of your eyeliner, apply your mascara and any other finishing touches to your makeup. Use a large, full-bristled brush to wipe off any shadow or eyeliner that might have fallen underneath your eyes. Use a q-tip dipped in makeup remover to remove any mistakes you made in your eyeliner or mascara application. Try a cream liner. Not quite the same as a liquid liner, cream based eyeliners are applied with a thin brush and a thick liner paste. Cream eyeliners give smoother lines than a pencil and are very similar in appearance and application as a liquid liner. 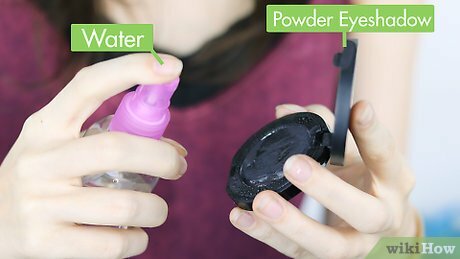 Make a liquid liner out of eyeshadow.Believe it or not, you an can actually make your very own liquid eyeliner using a mixture of loose powder eyeshadow and water. Mix the two together to form a thin paste, and use a clean eyeliner brush to draw it on. 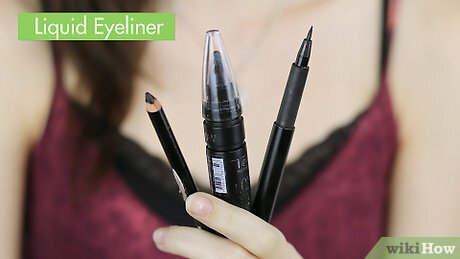 Heat up a liner pencil. When things are heated, they typically melt down into a liquid; the same process applies for pencil eyeliners. 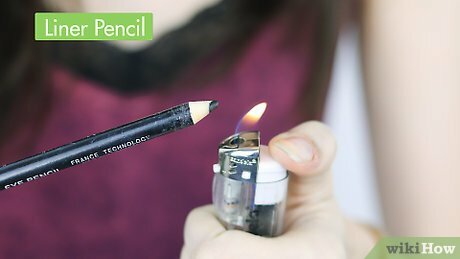 Use a lighter to heat up the end of an eyeliner pencil until it becomes very soft. Wait 10-15 seconds, and then draw on the creamy pencil over your lash line. Make sure it is not hot. When you switch to your next eye, keep using your dominant hand, that way you'll keep your hand steady and keep the stroke straight. Also, remember, practice makes perfect! If you get any in your eye, rinse and gently wipe the entire affected area. If you have injured yourself with the eyeliner stick, apply slight pressure with a damp, warm washcloth to your (closed) eye until the pain subsides. Liquid eyeliners are great and have a beautiful finished look, but make sure yours isn't clumpy, as this will probably not get that smooth line you want. Don't rush; Take your time and watch tutorials on Youtube to help guide you. Keep one eye open. Obviously the one that isn't at work. It's easier, and in the end, you'll have a nice straight line. Use good quality eyeliners with pep-tides to aid in lash growth. This also helps prevent your eyelashes from falling out due to mascara cleaning or rubbing. Be sure you are not allergic to the liquid eyeliner you are using. Always perform a wrist test, applying a small dab of the makeup on your wrist to see if you have a reaction to it. Article provided by wikiHow, a wiki that is building the world's largest and highest quality how-to manual. 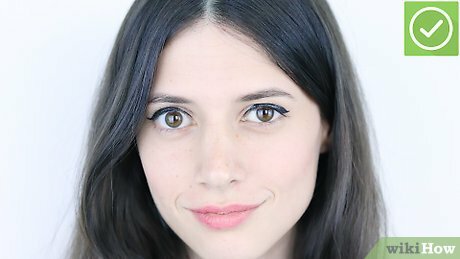 Please eidit this article and find author credits at the original wikiHow article on How to Apply Liquid Eyeliner. Content on wikiHow can be shared under a Creative Commons License.